all-time high of 69 percent. tudes toward the Middle East. tour of Israel. Story and pictures on page 9-12.
unity of the Jewish people." of 21, as the youngest U.S.
Beach County for 16 years. alive was a form of resistance. Warsaw for over thirty years. break her body and spirit. THE EDUCATORS COUNCIL AND JEWISH FEDERATION ARE BRINGING BACK DR.
Services begin at 8 p.m.
and to G-d, Torah and Israel. here in the United States." getting to know all about you..."
Activities Movies Dancing...And Much More! ALL JEWISH TEENS IN THE COMMUNITY ARE ENCOURAGED TO JOIN US. DONT MISS THIS GREAT EVENT. WE HAVE ONLY 50 SPACES. I am registered to attend Midrasha this year. I plan to attend but have not registered. centenary of Adolf Hitler's birth. is Once Again instead of Never Again. across the land in Skinhead activities. thoroughly; and the charges dismissed. standing policy toward the region. The U.S.
POSTMASTER: Send address chang lo The Jewish Floridian. Yom Hashoah as do the Jews. Jews! Loved it all .. .
Pictured (l-r) Esther Gruber, Al Schnitt, Alex Gruber. one grown and the other only twelve years old. estate taxes, and to make bequests to cherished friends and institutions. Americans would be outraged at the loss of a privilege they take for granted. disposition of their property at death. You have that right here, use it! make it as meaningful as possible. Pictured left to right: Mr.
where the doys ore cool and the nights ore filled with stars. true socials ond o vonety of programs to satisfy oil your needs. vised doy camp, teen programs, ond nite potrol. Jewish Unity. That's an offer your family really can't refuse. Leonid Feldman, and an Argentine-born Cantor, David Feuer. 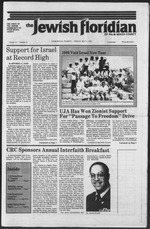 Shabbat, Friday May 12th, at 7 p.m.
May 12, 1989, 7 p.m.
UJA's last special campaign Israel. Israel should talk to the PLO. lence on the West Bank." more with Israel or with the Arab Nations?" At the state level, Ms.
the vital issues of our time,"
a better time for the great taste of Fteischmanns. Milton Gold, the trip leader. time I could have imagined,"
the day after she returned. nection left Miami at 7:30 a.m.
ory of her late husband. that it gets better every time. can't wait to go back to Israel. and sat in on a few lessons. "It was wonderful," he said. Beach County residents to Israel. Carol Greenbaum places a stone on the grave ofGolda Meir. Visiting the Western Wall in Jerusalem was the htghlxght of the tnp. Arrived Airport Hilton 3:15 a.m.
Coffee and cake set-up very nice. of one another. Arrive NY. 8:10 a.m. Went to bed at 10:30 p.m.
end of a long, exciting day! Quarter (old city) fantastic tour! various people to meet at 7:00 p.m.
good time and a lot of laughs. tears came and stomachs hurt! fast and leave for Tiberias. of the Mount of Olives. It shows the city during the days of the second temple. tzedakah boxes \n the ancient synagogue \n Safed. fiZVEi%"nX:?^^ Fr* **>"* OMrcnfrom the absorption center in Tiberias. , a wient of the Beit Byer Home for the aged. The excavations at Bet Shean are explained by our guide Danny. , ui(A Ethiopian immigrants at an absorption center at center in Tiberias. Ronni Epstein and Cynnie List atop an Israeli tank. Sis Gold, co-chair of the trip. French enjoy the shops in Safed. the participants of the Visit Israel Now Tour. Claire met her long-lost cousins. strategy and put on a demons! 5:00 p.m. at the Carlton Hotel. around 7:00 p.m. for dinner. at 10:00 p.m. early call tomorrow! courses and Claire ate everything! NO WAKE UP CALL TOMORROW! at 9:00 a.m. to go shopping! p.m. and was totally "wiped out". until about 5:00 p.m. to get dressed. dinner real nice group of people! trees in memory of our parents. danced around the dining room. and sang and had a lot of fun. breakfast buses left at 7:30 a.m.
dinner (10 people) food wasn't bad. to take shuttle to El Al plane. Arrived at Kennedy around 7:00 a.m.
luggage and bus was waiting for us. plished so much in so little time. and made the trip most enjoyable. and Debbie Hammer, Federation staff. Mink and Ronni Epstein, Federation staff. Pombro, Federation staff, and Claire Jaffe. Hy and Libby Taplin at the Aqueduct in Cesarea. /rreschool to Shoshana. Director of the Levy Day Care Center. Participants were impressed with th? Enrichment Center in Hod Hasharon. of the Senior Center in Hod Hasharon. tives of State of Israel Bonds. bicycle gathering dust in the shed, because your child has outgrown it. Whatever it is that you have to give, please give. WE NEED YOUR DONATIONS TODAY? We'll even accept your old Cars and Boats. Serving Dade, Broward and Palm Beach Counties. Having your money at Savings of America won't. We're America's largest savings institution. worth have grown to be the highest in the industry. than any bank or savings and loan. $2 billion in interest over the last year. Our deposits are growing to record levels. were losing billions in deposits. We're the nation's largest mortgage lender. year record of perfect safety. Your money earns great rates. Over 20 branches in South Florida to serve you. Consult your yellow pages for the branch nearest you. An Ahmanson Company. Over S40 billion strong. Over 350 branches coast to coast. David Goldberg, Campaign Co-Chair, Lillian Goldberg, Dance Co-Chairs. Victor Salitan. Barzelay, Shirley Butan, Leon Butan, Hy Field. Sylvia Feaerman, Bert Federman, Sehne Ftshkxn, Leonard Ftshktn. By U.S. Gov't testing method. ALL BRAND STYLES ABOVE ARE 100mm. Competitive lar and nicotine levels reflect the f TC method. system we can be proud of. non-members. For information call 832-0804.
and the hot and cold buffet. Cost: Your own fare plus tip. For information call Joan J. at 478-7430.
side dish suggestions, call Jerry at 736-5801.
non-stop dancing. Cost: $2 per person plus your own fare. For information call Roger 642-9499 or Terrie 689-7700.
information call Robin 626-3452 or Terrie 689-7700. We Create In Relationships, led by Lolli Cooper. Cost: $3. additional information call Ruth at 689-7700.
tip plus you own fare. For information call Edith, 793-5382.
call Marilyn 439-5524 or Arlene 622-6840.
help us plan exciting events for the upcoming months. and directions call Roberta 626-8914. Bagels, cream cheese, and etc. Temple Beth Sholom, 315 "A"
served, and all are welcome. at 9:30 a.m. Fee: $2. Club on May 8, at noon. marched from Auschwitz to Birkenau on April 14, 1988.
occupied the only shelter in America for Holocaust victims. Planning & Allocations Committee, 5:30 p.m.
p.m. American Jewish Congress, 1 p.m.
Widows and Widowers Support Group, 12:30 p.m.
Friday, May 12 Free Sons of Israel, board, 10 a.m.
May 14 at The Palm Hotel. Mid East Task Force, noon. Tuesday, May 16 Hadassah Henrietta Szold, 1 p.m.
Congregation Anshei Sholom Sisterhood, 1 p.m.
Wednesday, May 17 B'nai B'rith #3016, 7:30 p.m.
board, 9:30 a.m. Hadasah Shalom, 12:30 p.m.
7:30 p.m. Na'Amat USA Golda Meir, 12:30 p.m.
tions Council, noon Hadassah Z'Hava, 1 p.m.
Resource Development Meeting, 7:30 p.m.
For more information call the Jewish Federation, 832-2120.
tary Trail. Box 360091, Boynton Beach 33436. Phone 736-7687.
available at the Temple office. BAUM, Lester, 85, of Palm Beach. eral Chapels, West Palm Beach. berg, Chairman of the Board. pF Candle Lighting Time ? May 7, 7:36 p.m. J^, May 14, <^ 7:40 p.m.
balances, just weights shall ye have"
hired servant shall not abide with thee all night until morning. peoples, that ye should be Mine" (Leviticus 90.t6).